Even if things continue to deteriorate in China and the energy sector, Bank of America should still be able to earn money and continue to distance itself from the financial crisis. Bank of America is stronger than its been at any point since the financial crisis. This will help it weather the storms on the horizon. Image credit: iStock/Thinkstock. Despite the steep decline in Bank of America's (NYSE:BAC) stock price, investors in the nation's second biggest bank by assets can take comfort in the facts that it has limited direct exposure to China and the energy sector, rapidly improving earnings, and an abundance of capital. 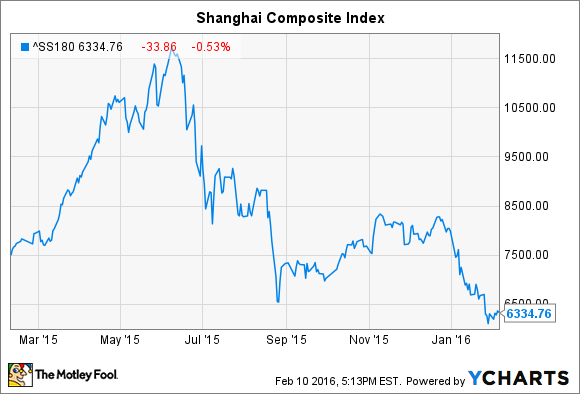 Much of the market turmoil right now can be traced to events in China. The Shanghai Composite Index, China's equivalent to the S&P 500, has plummeted over the last eight months, falling from a high of 11,500 last June down to 6,300 today. On top of this, China's economic growth rate, long in the 8% to 9% range, dropped to 6.9% last year. That was its slowest rate of expansion in 25 years. While none of this is good news for Bank of America, as a decline in global growth will hurt loan demand around the world, the bank's largely domestic orientation minimizes the direct fallout from these trends. According to Bank of America's latest 10-Q, it has $10.5 billion in exposure to China. That's nothing to shake a stick at, but most of that is likely associated with highly creditworthy corporate borrowers. Moreover, this is but a minuscule portion of Bank of America's $2.1 trillion in total assets. The other primary concern roiling markets right now concerns oil. 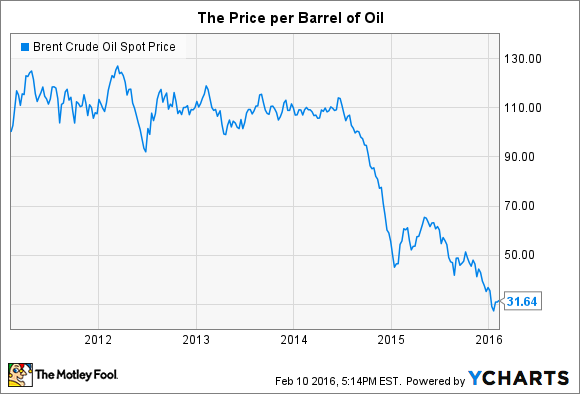 Just like China's stock market, the price of oil has plummeted since the middle of 2015. A barrel of oil cost $115 last June. Fast forward to today and its down to just over $30 a barrel. This is wreaking havoc on oil producers in the United States, with many beginning to teeter on the brink of bankruptcy. But so long as Bank of America's publicly disclosed estimates can be believed, the direct impact from this trend should also be relatively muted when it comes to the bank's balance sheet. On its fourth-quarter conference call, Bank of America's executives said that they expect up to $700 million worth of losses in their credit portfolio if the price of oil stays at $30 a barrel for the next nine months. Of that, moreover, the bank has already reserved $500 million. The net result is that -- again, assuming that Bank of America's estimates are accurate -- it only faces an incremental $200 million loss over the next three quarters. Bank of America's improving earnings will help offset that loss. 2015 marked the bank's best year in nearly a decade. It earned $15.9 billion over the 12-month stretch, which was roughly three times the $4.8 billion it earned the year before. To be clear, Bank of America still has a lot of ground to make up on the profitability front. Its return on average assets in 2015 was only 0.74%. That's roughly half of Wells Fargo's, and it's well below the 1% threshold associated with better-run banks. But it's heading in the right direction and should continue to gain momentum the further it gets from the financial crisis. Last but not least, even in the event that Bank of America loses more money than expected from the fallout in China and the energy sector, it has a substantial capital cushion to absorb losses. It currently holds $163 billion worth of Tier 1 common equity. Meanwhile, in order for it to be considered "well-capitalized" by regulators, it needs only $140 billion worth of Tier 1 common equity. Theoretically speaking, then, Bank of America could lose as much as $23 billion and still have a capital ratio that satisfies the regulatory minimum -- though, of course, regulators wouldn't be happy about the situation. A loss of this magnitude is highly unlikely. To put it in perspective, Bank of America's worst annual performance as a result of the financial crisis resulted in a loss of $2.2 billion. That could happen 10 times, in other words, and the $2.1 trillion bank would still have enough capital to continue making loans and accepting deposits. In sum, while times like these aren't reassuring to investors, the fact of the matter is that Bank of America is in its best position in a decade to deal with the turmoil.